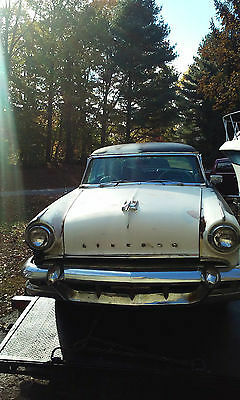 Up For sale is a 1954 Mercury Lincoln Capri everything is there ready to be restored this should be a numbers car very valuable for someone into restoring old cars. the original manuals come with the car. 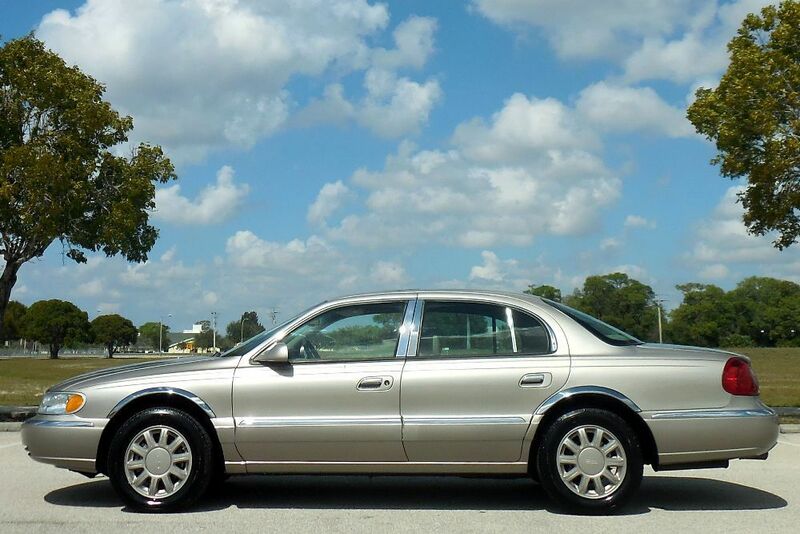 $8,000.00 for the car or negotiable. If you have any questions please contact Todd @ 240-997-0386 .....Serious inquiries only !!!! Runs and drives great. Shifts great. No mechanical problems. Normal scratches and dents for used SUV. Nothing major. Missing the emblem on the front of the vehicle. Passenger seat does not go up and down. All other features work as they should AC cold and heat hot. Has heated and cooled seats. All leather is in good condition. DVD player works and has headphones with it. Good tires with about 50% tread. Power lift gate and power running boards. All in all a very sound SUV. I drive it daily so the miles will go up a little. 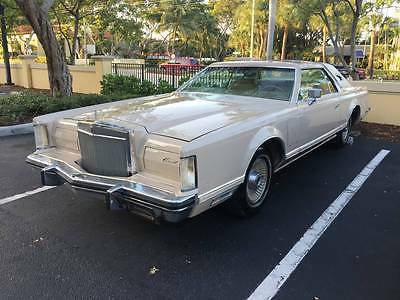 One of a kind pristine power everything truly beautiful 1979 Lincoln Continental Mark V Cartier Edition. This car has the beautiful velour seats that are really in an amazing condition. This is a running cruiser like no other very well maintained. You'll get lots of compliments on the car. People love it. Great stereo. Great Cruiser. Amazing Condition. I am a private seller. Give me a call 561-306-3861. 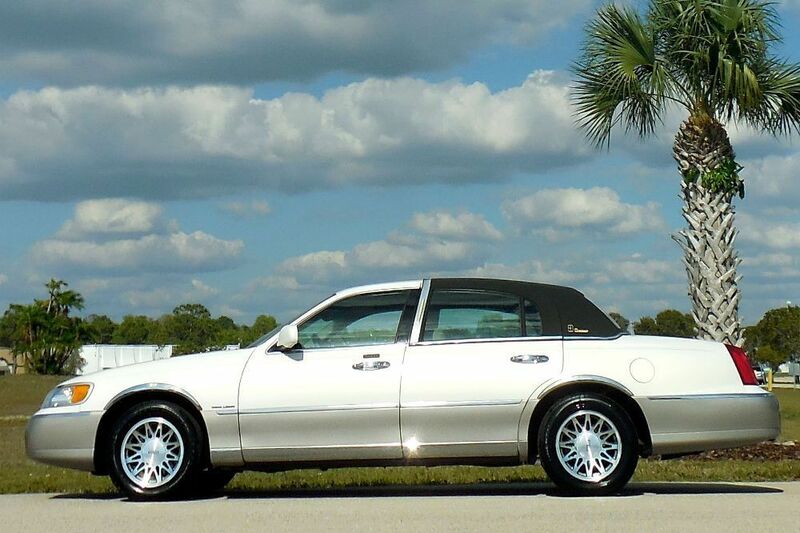 Hi there, I am selling my 2003 Model Lincoln Towncar [Signature Edition] in a White & Champagne 2-tone pain. Very well taken care of, clean & non-smoking, I've had the car for 6 years. 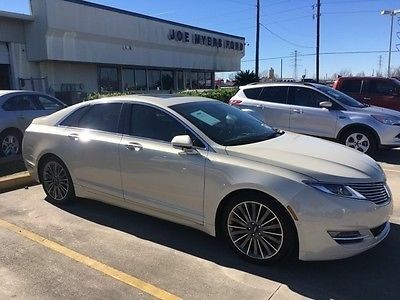 • 4.6 Liter / V8 Engine (172,300 Miles).• 16" Lincoln wheels, all tires have good amount of tread left.• Windows have been tinted: 35% in the front & 20% in the back.• Aftermarket HID Headlights• Aftermarket Keyless Entry, Trunk Pop & Automatic Start installed w/2-way Pager. 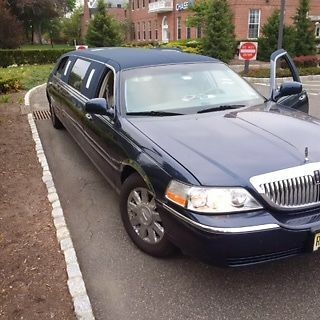 (Factory keyless remote included)• Factory iPod Connection Kit w/ Bluetooth Audio Streaming.• All interior lighting upgraded to LED crystal clear bulbs.• Leather Interior, Heated front seats!• Clean Title in hand.• Car runs & drives great, smooth, no mechanical issues. Oil change done 1,000 miles ago (good for another 4,000 miles) & tags are good until August 2017. Here are a few minor imperfections as I like to be totally up front and honest:- Driver seat does not move forward/backward. seat motor needs to be replaces (seat still reclines & lowers/rises). I'm 5'9" & sit comfortably with the current position of the drivers seat.- Backup Parking sensor needs to be replaced for functionality. (if desired)- Front Bumper has some scrapes that may be buffed out & Rear bumper has 3 smaller scratches.- Passenger side of the windshield has a footlong crack (not as noticeable after it has been professionally filled and sealed). Overall a beautiful & reliable car at a low price, you will not be disappointed. Let me know if you're interested or have any other questions, call/text me at (509)979-6523. Thank you for your time and have a nice day! *This car is being sold locally as an in person PICKUP ONLY, in Los Angeles, CA. 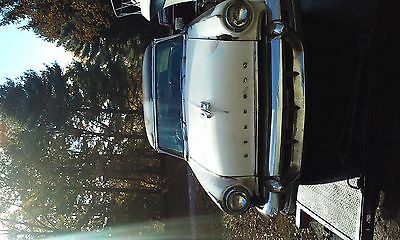 I have the right to end the auction as the car is being sold outside of ebay as well. FL clear title March 1972 born date Highlights and why more desirable - notice only early 72 cars have the low bumper not covering that smile and carry over engine from 71 so higher HP. 335 500ft tq. 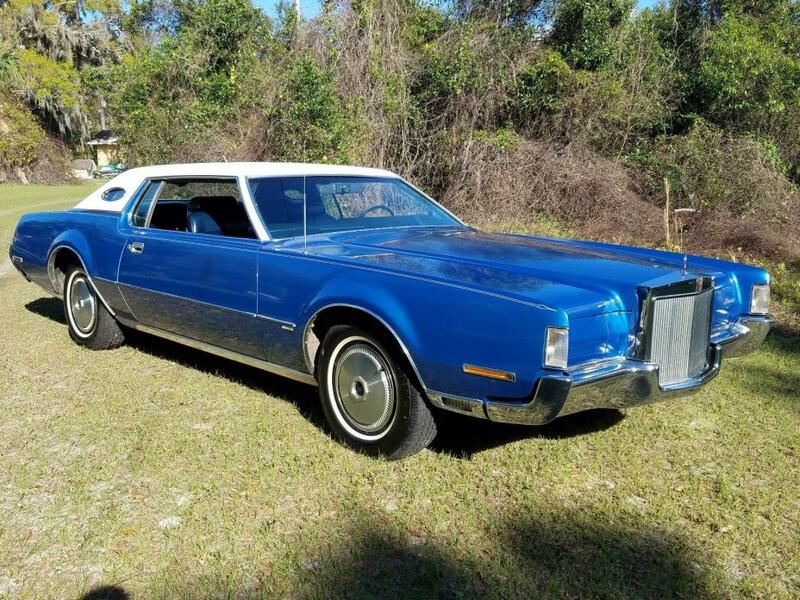 Early 1972 Lincoln MARK IV little over 40,000 original miles has the higher HP 460 sporting Moondust blue metallic exterior paint and dark blue leather with a white top. Not as common as other colors seen in these beautiful pieces of history. This car was picked up by a family from the original owner. His aunt/uncle had since new, I have the owners Manuel, brochure and other papers. 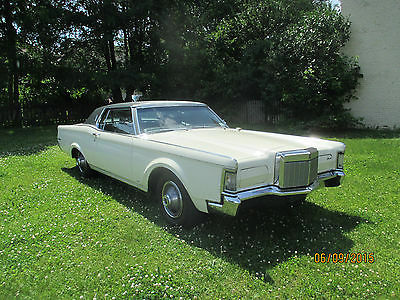 The car was highly optioned above the base Lincoln MARK IV. The paint shows well in the pictures but has some blistering on the hood and trunk, the car has lauqer paint and not to bad in dim light or 10ft. Tires are basically new, the a.c. does work but has a leak, and the antenna isint going down, i havent attended to any of that yet, might be working soon ,everything else works. The car has new parts and maintanced items that have been done. You can hop in the car fire it up and cruze down the road with no worries of mechanical problems. Interior is in very great shape with a crack on the driver side door panel plastic area, headliner and everything else appears to be gorgeous. There is no rot or crazy rust, or any real rust I can see. Now all cars have surface rust in areas as we know but this car is nice. I will upload more pictures later. This listing can end at anytime, non refundable deposit through PayPal etc. If I don't get what I'm looking for I'll relist it or take it to another place to sell. Contact for any info, leave a number in your message, thank you. Alisha,Malory,Shelby (785) 823-2237 3450 S 9th St Salina Kansas 67401 ? ? ? ? 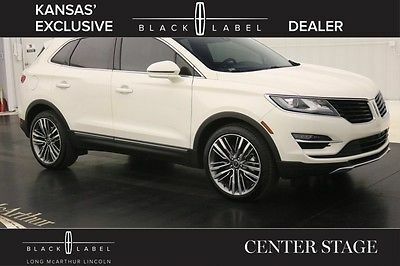 2016 Lincoln MKC All-wheel Drive Black Label ? ? ? ? 1 of 41 ? View Large Images ? ? 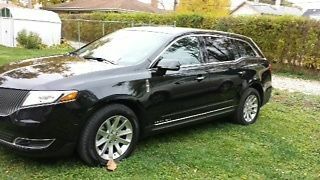 Description NEW AT LONG MCARTHUR, A 2016 LINCOLN MKC BLACK LABEL AWD, 2.3L ECOBOOST, 6-SPEED AUTOMATIC, VENETIAN LEATHER INTERIOR, ALCANTARA SUEDE HEADLINER, BLACK STRIPE WOOD APPLIQUES, VENETIAN/SUEDE LEATHER SEATS, NAVIGATION, PANORAMIC VISTA ROOF, FRONT HEATED/COOLED SEATS, AUTO HID HEADLAMPS, SIGNATURE LIGHTING, DAYTIME RUNNING LIGHTS, 20" PAINTED ALLOY WHEELS, WELCOME ELEMENTS, POWER FOLD MIRRORS, POWER HEATED MIRRORS, BLIND SPOT MONITORING SYSTEM, AUTO DIM DRIVER SIDEVIEW MIRROR, INTELLIGENT ACCESS, REMOTE START, ROOF RACK, PRIVACY GLASS, EMBEDDED MODEM, RAIN SENSING WIPERS, SPOILER, REAR DEFROST, REAR WIPER, REVERSE SENSING SYSTEM, REAR VIEW CAMERA, POWER LIFTGATE, HANDS-FREE LIFTGATE, CARGO COVER, CARGO NET, FRONT BUCKET SEATS, FRONT POWER SEATS, REAR HEATED SEATS, POWER WINDOWS, POWER LOCKS, DRIVER MEMORY, POWER TILT/TELESCOPE STEERING WHEEL, LEATHER HEATED STEERING WHEEL, CRUISE CONTROL, BLUETOOTH, DUAL ZONE AUTO CLIMATE CONTROL, CD PLAYER, SIRIUS SATELLITE RADIO, PUSH BUTTON START, PUSH BUTTON SHIFT, SYNC 3, AUTO DIM REARVIEW MIRROR, GARAGE DOOR OPENER, THX CERTIFIED AUDIO SOUND SYSTEM, AMBIENT LIGHTING AND MANY MORE FEATURES! CENTER STAGE CENTER STAGE is a showstopper. Inspired by the fashionable theatre scene, this Lincoln Black Label design theme is for those with a flair for the dramatic. In keeping with the magical energy that rises with the striking red curtains on opening night, Center Stage imparts a sense of excitement to every drive with its intensely deep backdrop and vivid accents. Lincoln Black Label Center Stage themed vehicles make you the star of every scene, with luxurious interiors trimmed in dramatic Jet Black Venetian leather accented by eye-catching Foxfire Red in all the right places. Alcantara also wraps the headliner in Jet Black and trims the carpeted floor mats in Foxfire Red. A high-gloss black accent on the exterior badging elegantly identifies each Lincoln Black Label vehicle. Exotic wood accents on the doors, steering wheel and instrument panel are Onyx. Both are reconstructed woods layered in a specific pattern to enhance the architectural design of each interior. Jet Black leather seats feature our exclusive Diamond-L perforation pattern on the Alcantara inserts overlaying Foxfire Red. They’re finished with precisely stitched tuxedo striping and Foxfire Red piping . Black Label Certified Pre-Owned Program Premium Maintenance Plan: 5 year/60,000 miles with 1st Day Loaner Every Black Label vehicle is provided a Premium Maintenance Plan through our ESP program at the time of sale. This includes a 1st day loaner provision that provides a Lincoln loaner vehicle while your vehicle is in for repair. Service Pick-Up and Delivery: This service is offered to clients who reside within 30 miles of the dealership. 1 st Annual Vehicle Detail: Black label clients receive a complimentary detail after their first ownership anniversary. This includes buffing if necessary, hand waxing, wheel cleaning, and full interior cleaning All Benefits of Lincoln Certified Pre-owned 6 year/100,000 mile comprehensive warranty 200 point inspection by factory trained technicians Vehicle History Report A full tank of fuel, fresh oil and new wiper blades at delivery 24-hour roadside assistance 1.9% apr with approved credit for 72 months VIN : 5LMTJ4DH7GUJ31889 Stock # : 161240B AutoCheck History Report Vehicle History Reports ? 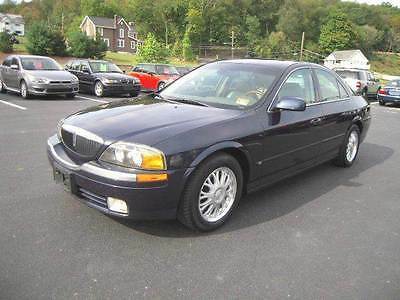 Click here to see theVehicle History Report Video About Us About Us Long McArthur has been in business since 1942 and is family owned. North McArthur, President and West McArthur, Vice President are the 4th generation and current owners. The employees at Long McArthur are treated like family and we appreciate our customers for choosing us for the vehicle needs whether purchasing a vehicle or servicing a vehicle. Our primary goal is to satisfy our customers. Our online dealership was created to enhance the buying experience for each and every one of our internet customers. If you have any questions, please feel free to contact us. Get to know us better check out our about page! Click Here to Visit our store for more inventory! Video Testimonials Price includes all public retail rebates and may require you to finance through Ford Credit. Rebates are based on Salina, Kansas zipcode, call to verify your zip code's rebates and any other rebates that you may be eligible to claim. Shipping In the past years, Long McArthur has shipped over 400 vehicles to customers all over the United States! Call today for a shipping quote (785) 823-2238! We understand this can be a stressful time for the customer and that why we are here! If you feel more comfortable flying in we will pick you up at the airport! Come see the Midwest and see why so many people have bought from us! ? Apply Now Secure Credit Application Applying for a vehicle loan online is one of the quickest and easiest application methods. Our secure application is easy to complete, all you need are a few personal and employment details. Contact Long McArthur Ford 3450 S 9th St Salina Kansas 67401 View Map Ask for:Alisha,Malory,Shelby Contact: ?Contact Us BDC Team :(785) 823-2237 Hours Mon-Fri:08:00 AM-08:00 PM CST Saturday:08:00 AM-08:00 PM CST Sunday:Closed Options and Standard Features Options ? Navigation System ? 10 Speakers ? Am/Fm Radio: Siriusxm ? Cd Player ? Hd Radio ? Mp3 Decoder ? Radio Data System ? 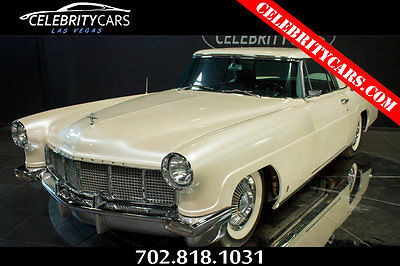 Radio: Lincoln Prem Sound System/Singlecd/Mp3/Nav ? Siriusxm Satellite Radio ? Air Conditioning ? Automatic Temperature Control ? Front Dual Zone A/C ? Rear Window Defroster ? Memory Seat ? Power Driver Seat ? Power Steering ? Power Windows ? Remote Keyless Entry ? Steering Wheel Memory ? Steering Wheel Mounted Audio Controls ? Adaptive Suspension ? Four Wheel Independent Suspension ? Speed-Sensing Steering ? Traction Control ? 4-Wheel Disc Brakes ? Abs Brakes ? Dual Front Impact Airbags ? Dual Front Side Impact Airbags ? Emergency Communication System ? Front Anti-Roll Bar ? Knee Airbag ? Low Tire Pressure Warning ? Occupant Sensing Airbag ? Overhead Airbag ? Rear Anti-Roll Bar ? Power Moonroof ? Brake Assist ? Electronic Stability Control ? Blind Spot Sensor ? Exterior Parking Camera Rear ? Rear Parking Sensors ? Delay-Off Headlights ? Front Fog Lights ? Fully Automatic Headlights ? High-Intensity Discharge Headlights ? Panic Alarm ? Security System ? Speed Control ? Auto-Dimming Door Mirrors ? Bumpers: Body-Color ? Heated Door Mirrors ? Power Door Mirrors ? Roof Rack: Rails Only ? Spoiler ? Turn Signal Indicator Mirrors ? Auto Tilt-Away Steering Wheel ? Auto-Dimming Rear-View Mirror ? Compass ? Driver Door Bin ? Driver Vanity Mirror ? Front Reading Lights ? Garage Door Transmitter: Homelink ? Genuine Wood Dashboard Insert ? Genuine Wood Door Panel Insert ? Heated/Cooled Venetian Leather Front Bucket Seats ? Illuminated Entry ? Outside Temperature Display ? Overhead Console ? Passenger Vanity Mirror ? Rear Reading Lights ? Rear Seat Center Armrest ? Tachometer ? Telescoping Steering Wheel ? Tilt Steering Wheel ? Trip Computer ? Front Bucket Seats ? Front Center Armrest ? Heated Front Seats ? Power Passenger Seat ? Split Folding Rear Seat ? Ventilated Front Seats ? Passenger Door Bin ? Wheels: 19" Premium Dark Satin Alum Multi Finish ? Rear Window Wiper ? Speed-Sensitive Wipers ? Variably Intermittent Wipers ? 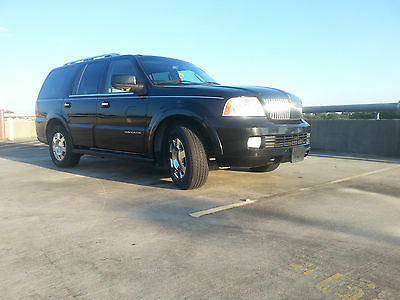 3.51 Axle Ratio Basic Information Stock Number: 161240B VIN Number: 5LMTJ4DH7GUJ31889 Style Name: All-Wheel Drive Black Label Make: Lincoln Model: MKC Model Year: 2016 Vehicle Type: SUV Vehicle Trim: Black Label Exterior Color: White Body Type: SUV Interior Color: Jet Black Engine Compressor: Intercooled Turbo MPG Automatic City: 18 MPG Automatic Highway: 26 Engine Description: Ecoboost 2.3L I4 Gtdi DOHC Turbocharged VCT Fuel Type: Gas Fuel Induction: Gasoline Direct Injection Valves Per Cylinder: 4 Aspiration: Turbocharged DriveTrain 4WD Type: Automatic Full-Time Differential Limited Slip: Brake Actuated Driven Wheels: All-Wheel Drive Locking Hubs: Permanent Transmission: 6-Speed Automatic Wheels Rims: Gray Aluminum Wheels Spare Rim Type: Steel Drive Train Type: AWD Suspension Active Suspension Independent Suspension: Four-Wheel Stabilizer Bar: Front And Rear Instrumentation Clock Compass External Temp Low Fuel Level Tachometer Trip Computer Roof and Glass Front Wipers: Variable Intermittent Privacy Glass: Deep Rear Defogger Rear Wiper: Fixed Interval Roof Rack: Rails Only Sunroof: Express Open/Close Glass In Car Entertainment Antenna Type: Integrated Roof Audio System: Siriusxm AM/FM/HD/Satellite Speakers: 10 Seats Drivers: Multi-Level Heating Drivers Height: Power Drivers Lumbar: Power 2-Way Drivers Power: 8 Drivers Ventilated: Ventilated Passenger: Multi-Level Heating Passenger Height: Power Passenger Lumbar: Power 2-Way Passenger Power: 8 Seating Capacity: 5 Front Seat Type: Bucket Upholstery: Leather Center Armrest Folding: Fold Forward Seatback Convenience Center Console: Full With Covered Storage Cruise Control Cupholders: Front And Rear Door Pockets: Driver, Passenger And Rear Overhead Console: Mini With Storage Power Outlets: 4 Remote Trunk Release: Proximity Seatback Storage: 2 Steering Adjustment: Tilt And Telescopic Steering Power: Speed-Proportional Electric Power Steering Universal Remote Transmitter Auto Dimming Mirrors: Electrochromatic, Driver Only Power Mirrors: Power Remote Power Retractable Mirrors Power Door Locks Windows: Power Windows Navigation System: With Voice Activation Satellite Communication: SYNC 3 911 Assist Memory Features Exterior Mirrors Memory Features Number Of Drivers: 2 Memory Features Steering Wheel Comfort Air Conditioning: Automatic Air Filtration: Interior Air Filtration Trunk Lights: Cargo Area Light Center Console Trim: Leather/Aluminum Dash Trim: Aluminum/Genuine Wood Door Trim: Aluminum/Genuine Wood Mats: Carpet Front And Rear Reading Lights: Front And Rear Steering Wheel Trim: Leather/Metal-Look Vanity Mirrors: Dual Illuminated Vanity Mirrors Features Aux Engine Cooler: Regular Duty Bumpers: Body-Colored Door Reinforcement: Side-Impact Door Beam Safety NHTSA Passenger Grade: Good NHTSA Driver Grade: Excellent NHTSA Side Impact Front Grade: Excellent NHTSA Side Impact Back Grade: Excellent Turning Circle: 38 ABS: 4-Wheel Head Airbags: Curtain 1St And 2Nd Row Anti Theft System Brake Assist: Braking Assist Safety Locks: Manual Daytime Running Light Engine Immobilizer Headlights Auto Delay: Auto Delay Off Headlights Dusksensor: Dusk Sensing Front Headrests: Manual Adjustable Rear Headrests: 3 Rear Center Seatbelt: 3-Point Belt Safety Signal Mirrors: Turn Signal In Mirrors Safety Stability Control Driver And Passenger Airbag Side Airbag Stability Control: Stability Control With Anti-Roll Door Reinforcement: Side-Impact Door Beam Towing and Hauling Tie Downs: Cargo Tie Downs Doors Rear Door Type: Power Liftgate Side Door Type: Conventional Dimensions Front Head Room: 39.6 Inches Front Hip Room: 54.4 Inches Front Shoulder Room: 56.0 Inches Front Leg Room: 42.8 Inches Rear Head Room: 38.7 Inches Rear Hip Room: 52.8 Inches Rear Leg Room: 36.8 Inches Rear Shoulder Room: 55.3 Inches Luggage Capacity: 25 Cu.Ft. Length: 179.2 Inches Width: 73.4 Inches Height: 65.2 Inches Wheelbase: 105.9 Inches Max Gross Vehicle Weight: 7,400 Lbs. Curb Weight: 3,952 Lbs. eBay Terms Placing a Bid: Your bid constitutes a legally binding contract to purchase this vehicle. Please do not bid if you're not seriously interested or financially able to purchase this vehicle. 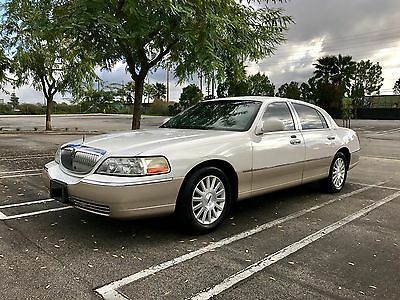 Please read eBay's User AgreementLong McArthur Ford reserves the right to, Obtain and verify the registered information of all users who bid on this auction. Cancel any and all bids at our discretion, or end the auction early if necessary.Bidders Age: You must be 18 years of age or older to Bid. Special eBay Bid Retraction Rules: Please read eBay's "Retracting a Bid" If you place a bid before the last 12-hour period of the auction: You may retract that bid before that last 12-hour period but only for exceptional circumstances. You will not be allowed to retract that bid during the last 12-hour period of the auction.If you place a bid during the last 12-hour period of the auction: You will be allowed to retract the bid for exceptional circumstances but only if you do so within one hour after placing the bid.Funds & Financing: For help in arranging for a Pre-Approved loan or for any questions please e-mail or phone at (785) 823-2237 prior to bidding.Buyers Inspection: Long McArthur Ford has done our best to disclose all information known about this vehicle for auction. Long McArthur Ford welcomes a buyers inspection. If you plan to have a buyers inspection, please make sure you inspect the vehicle prior to the auction ending. Inspection fees if any are Buyers responsibility.Representations and Warranties made by seller: Manufacturer's warranties may still apply. Extended warranty may be available, e-mail or phone at (785) 823-2237 for details. Taxes and Registration fees: Out of state buyers are responsible for all state, county, city taxes and fees, as well as title service fees in the state that the vehicle will be registered. All taxes and fees must be paid in full in order for vehicle to be titled and registered.Please note a $299.95 administrative fee will be added to all vehicle purchases.Title Information: Vehicles titles may be held by banks or lenders as collateral for loans. In many cases there is a delay in receiving the original instruments up to 21 days from the time we pay a vehicle off. While we usually have all titles in our possession at closing, there are occasions where we may be waiting for them to arrive. If payment is made by cashier's or personal checks we will hold all titles for 10 days or until funds have cleared.Shipping & Delivery: All shipping charges are buyer's responsibility. Long McArthur Ford will help with shipping arrangements but will not be responsible in any way for claims arising from shipping damage!Licensed Carriers are generally insured for $3,000,000.00. We assume no responsibility for damages incurred after the vehicle leaves our showroom. All shipping arrangements are provided by Long McArthur Ford as a courtesy. We are not affiliated with any carrier. Any claims or other communication regarding shipment of vehicles will be between you and the shipper, not with Long McArthur Ford.The amount of time it takes for delivery is dependent on the carrier, but is generally 7-14 days from the date the vehicle is picked up from our facility until it is delivered to your destination. Verify with the shipper for an Estimate Time of Arrival to be sure.Finalizing your Purchase: Long McArthur Ford will contact the successful high bidder by e-mail after the auction closes.Successful high bidder MUST communicate with at Long McArthur Ford by e-mail or phone (785) 823-2237 within 24 hours of the auction ending to make arrangements to complete their transaction. If we cannot confirm your intention to buy or the sale is not completed within 5 days, we reserve the right to relist this vehicle or sell to any other qualified buyer.In order to secure bid on vehicle, Successful bidder (BUYER) must within 24 hours of bid closing send to Seller a Deposit in the amount of 10% by major credit card, cash in person or bank certified funds. Within 72 hours of bid closing, Buyer must send balance of funds by cash in person or bank certified funds to Seller.At time of sending initial deposit, Buyer MUST fax copy of their State issued valid Driver License. Furthermore, before said vehicle is released for shipment to Buyer, all other Sale related and title related paperwork must be signed and returned complete to Seller. Copyright © 2017 Auction123 - All rights reserved. - Disclaimer +- Auction123 (a service and listing/software company) and the Seller has done his/her best to disclose the equipment/condition of this vehicle/purchase. However, Auction123 disclaims any warranty as to the accuracy or to the working condition of the vehicle/equipment listed. The purchaser or prospective purchaser should verify with the Seller the accuracy of all the information listed within this ad. Selling a Vehicle? Create Professional Listings Fast and Easy. Click Here!